Inyanga, Warwick Triangle. Photograph by Roger Jardine. I’m hopping about on one leg, in the middle of a busy walkway, obstructing morning commuters. Directly across from me is the herb-sellers market, above me cars funnel into the city while below colourful aprons are strewn across stairs, the ladies selling them sitting on upturned crates. “Is this the right size?” I ask Crops as I squeeze my foot into a cross-strapped rubber sandal. “Sure, sure, stretch to fit,” he answers. Crops makes and sells imbadadada (a home-made shoe or literally ‘someone who walks with an awkward gait’) from a small outlet on the edge of Warwick Triangle. Pairs are lined up outside his shop, in rows based on style and size. The imbadadada is a thick, hard-wearing sandal, with two straps along the front and one along the back, originally made by Zulu tribesmen. Johnny Clegg made these shoes popular with a wider audience in the eighties, dancing in a pair on stages across the world. Crops shows me some shoes with the Nike and Adidas logos roughly carved into the straps. “Aren’t you scared of copyright?” I ask him. “Not in Warwick,” he smiles. I like these shoes, they’re practical, surprisingly comfortable and well-made. With the right marketing they could even be ‘green’. “How much?” I ask. “R100 for the old style, R130 for the new.” Not bad for a pair of Nikes. Nestled between a taxi rank and a train station, and huddled under a freeway (the main road leading into the city of Durban), Warwick Triangle is a vibrant market community that services over 400 000 people per day. As the entrance to the city, a constant stream of people move in and out of precinct, either on their way to work or returning home. Synonymous with Durban and the melting pot of cultures it represents, Warwick Triangle is defined by two things – trade and transport. Closely linked to the history of the city, Warwick Triangle traditionally consisted of four markets, dating back over 100 years. The City Market was a whites-only trading area, the Native Meat Market sold, you guessed it, meat, while an enclosed Indian Market called the Victoria Street Market burnt down in the late 1980s and has since be recreated as a tourist shopping mecca. A street market in Victoria Street, known as the Early Morning Market, was formalised in 1910 when the town council built the structure housing it, which still stands. Today, the area exists as a site of intersection – here commuters swap from train to taxi to bus – ferried in from the townships and suburbs surrounding the city. Warwick is all about these commuters. They are the lifeblood of the traders who work in the area, and in turn, the traders provide an easily and accessible – not to mention cheap – way for commuters to do their daily shopping. As a transport node, hundreds of thousands of people pass through the precinct every day and the traders tap into this ready-made market, offering commuters everything they could need. The combined monthly turnover from the markets is greater than that of the Pavilion, a large, upscale shopping centre in an affluent suburb of Durban. And it is easy to see why. Every free corner has been commandeered by an entrepreneurial trader, selling fruit, cigarettes, sweets and a multitude of other products. Tables thrown up in walkways channel passerbys closer to a smorgasbord of merchandise laid out for view, stairways and pavements form shops in their own right. Grass brooms, tied together, stand upright while brightly coloured toys – trucks, rattles and handheld electronic games – are laid out on the pavement next to rows of Tiger Balm, razors and combs. A large pile of zips, each a different colour and size, sits next to an impromptu stationers offering sticky tape, scissors, pencils and even a calculator, all combining to form a canvas that is unique to this city. The Warwick Station is the focal point for the area. Here street traders jostle for space along crowded walkways while more formal shops serve as waiting rooms for inyangas or changing rooms for tailors and dress-makers. A few resourceful traders have portable televisions at their stalls, powered by car batteries and attracting a crowd by showing the latest soapie, gospel sensation or sports match. A row of lean-tos, constructed on an unfinished flyover, protect the herb-sellers and their produce from the sun and rain while the cavernous Early Morning Market hosts a cacophony of bargains and beetroot. To the uninitiated shopper, it may appear that the layout is haphazard, informal, organic but there are clear demarcations between fashion, health and food, and the traders are well organised, each section with their own association to protect their rights. Apart from the intersecting lives of commuter and trader, Warwick also serves as intersection of another sort – between rural and urban, between African and Indian and between tradition and modernity. In this, Warwick is an anomaly. Here herbalist’s stores contrast with the graves of Islamic prophets, inyangas sit across from the bovine head sellers restaurant, all against a moving backdrop of a steady stream of commuters heading from the train to taxi and back. The city’s links with rural KwaZulu-Natal and the Eastern Cape are strong, with the train station and taxi ranks of Warwick entry and exit point. As well as people, herbs and plants travel to the city from across the country. Sold in the herb-sellers market, located on an abandoned flyover joining the two halves of the Warwick Triangle, this is wholesale muti trading. Deliveries are made 24 hours a day with plants coming in from indigenous forests around Southern Africa. The volume of produce is staggering and the equivalent in pharmaceutical medicine is unthinkable. Tubers sit in wooden crates, still holding on to the soil they were dragged from. Bulbs are piled in large canvas bags and bundles of bark tied together with string. Some plants are processed on site, hacked down with pangas or powdered in grindstones, while others are offered whole. One stall sells the African Potato, used for building the immune system and once mooted as a ‘cure’ for HIV/Aids by our erstwhile Health Minister. Other plants I recognise from my garden – Wild Garlic, Bulbine – but here their use is medicinal rather than decorative. More mysterious in origin are the multicoloured powders, in small plastic bags, that hang from ceilings of certain stalls. It all adds up to a pharmacy on your doorstep for a fraction of the price of Western medicine. “The different plants I sell have different muti,” Mandla continues. “Some are for the spirits, others for sickness and others for everyday problem. These sbunge herbs is used by the business people for success with their work.” He points out a few more. The imphepho I recognise. A strong smelling herb that is burnt to communicate with the ancestors and which had been recommended to me to keep the ants out my house (it works). Others, such as the pepper tree bark are new to me. It is used to control flu and stewed in hot water like a tea. Some have more esoteric uses. The black stinkwood tree’s bark is powdered and used to cure ‘bad luck’. Ever the salesman, Mandla also produces and sells a health tonic, available in old spirits bottles, whose secret recipe will cure everything from the common cold to arthritis. How much does all this cost? As with most things, it depends on supply and demand. The common plants start at a few rands while the more rare herbs can set you back a few hundred. However, this is a small price to pay for a tangible link to a culture that is often overshadowed by Western values. This market connects city residents with their rural roots. Here they can pick up a remedy that their gogo may have given them as a child, consult with an inyanga or collect the necessary ingredients for traditional ceremonies. This cultural link can also be seen in the fusion of Africa and India that the area has become known for. Incense fills the air in sections of the market, while Hindu prayer tapes compete with kwaito beats. The Indian community has, in fact, a long history of trading and living in Warwick. Many present day traders are third or fourth generation and Grey Street, the historic cultural and business heart of the Indian community in Durban, is a short distance away. The Early Morning Market is populated by a healthy mix of Indian and African traders while, surprisingly, the muti trade is also racially mixed. Indian traders sell plants, sangomabeads and paraphernalia, speak perfect isiZulu and have an in-depth knowledge of the traditions they support. Located to the rear of the herb-sellers market is a series of small shops and a street market. At the entrance to the station, in the centre of this street market and juxtaposed with the heady commercialism of the area, is the Badsha Peer cemetery. Dominated by the beautiful kramat of Badsha Peer, an 18th Century prophet who came from India to Durban on the SS Truro, the cemetery is a quite oasis in the bustle of Warwick Triangle. Fanning out from the kramat are the family graves of Muslims who live in the city centre, each lavishly planted with plants and flowers giving the impression of a well-maintained garden instead of cemetery. Of interest to scholars of recent South African history, is the grave of Dr Rick Turner, academic, anti-apartheid activist and Islamic convert who was assassinated by the government in 1978. With one of the main roads in Durban recently named after Turner, I ask the priest if this renewed interest has led to more visitors to his grave. “Only one woman comes, every month, to visit him,” he tells me. A short step out of the cemetery and the stillness is gone. However, this mix of spirituality and commerce is echoed throughout the markets, with traders placing images of Hindu saints on their stalls and inyangasinvoking the ancestors for a fee. Parallel to the cemetery but located on the far side of the train station is the Early Morning Market. This ninety-nine year old structure has Victorian cast iron gates, but once inside you are assailed by sights and smells that are uniquely present-day Durban in construct. Chicken cages are stacked against one wall – offered for sale (alive or dead) by the chicken ladies – while the freshest fruit in town, still reasonably priced, is sourced from market gardens surrounding the municipality. Tomatoes, bananas, onions, brinjals and beans are piled high in enamel bowls, weighed in coal bucket-shaped scales before being sold. Bollywood show tunes sing out over worn speakers while Indian traders shout out the daily specials inisiZulu, hoping to attract passing commuters. The market sells fresh fruit and vegetables, along with live chickens, flowers, spices and seedlings. Most of the food is grown locally, in the market gardens of Claire Estate and small-holdings on the outskirts of the city, forming a valuable economic ecosystem. These market gardeners, and the Early Morning Market itself, form a living legacy of the Indian indentured labourers who came out to Durban in the 1860s to work as sugar cane cutters. Many stayed on once their period of indenture was over, growing and trading fresh fruit and vegetables. The families of some of these first traders still operate from the very same market as their grandparents. Behind the scenes, an army of porters keep the markets going, carrying bundles of plants and fresh vegetables to their respective stalls. Navigating through the tight alleys requires intense concentration and, as the porters are paid per load, maximum speed. Once they start on their journey they don’t stop until they reach their destination. A sharp whistle is all you hear to warn you to get out of the way or risk a cart crashing into your ankles. At night, most of the informal traders pay these porters to return their goods to storage areas in the streets and buildings surrounding the markets. These porters have been working side by side with the Indian, and now African, traders since the markets opened. Mbhedeni Malan is one them and has been pulling carts for more than 45 years. It is a family business – he took over the cart from his father, who was one of the first porters when the market opened in 1910. They start early, arriving at five in the morning to load stock for traders who start selling at 6 am. Those porters without a cart can rent one for the day at the market’s entrance. The porters charge per load, depending on quantity and type of produce. Mbhedeni explains, “I charge something like R5 for 10 crates of oranges and R4.60 for 25 sacks of onions. Each day I make about R120.” This money is sent home to feed his family of eighteen in Pondoland, Eastern Cape. While the history of the area can lead to romanticism, Warwick is also a microcosm of the problems of the city. It is dirty, overcrowded and under-resourced. It is also struggling with the convergence of traditionalism and modernity – plastic shoes from China compete with the imbadadada – and here traditional practices are adapted for a modern, urban audience. 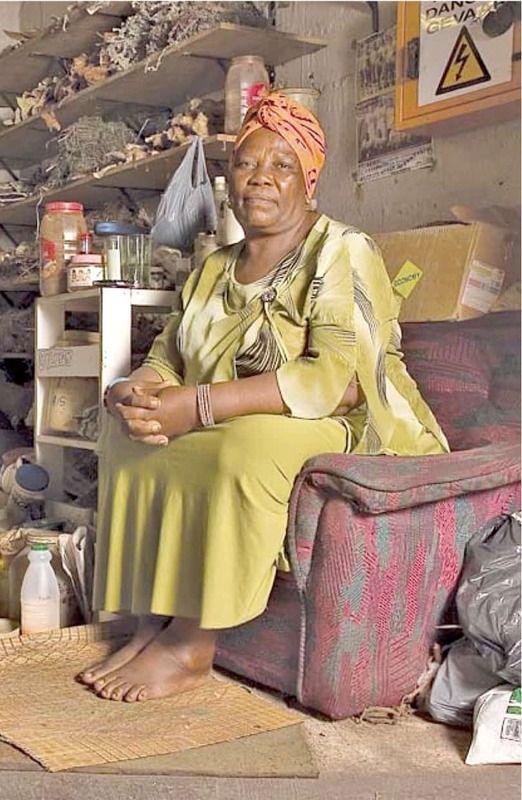 The traditional healers are at the forefront of this clash with their services gaining recent interest from the public health sector – the government is now waking up to the service that traditional healers offer to a large percentage of the population. Interest in indigenous knowledge and the benefits it offers has also seen a number of researchers descend on the market in recent years. This knowledge is, however, deeply embedded in a culture and community history. I have a rash on my foot. “Can you fix this?” I ask, showing the rash. “Is it itchy? I can fix itchy,” she replies. No, not itchy. “Go to the doctor then,” is her response. This is advice she often gives. In fact, Ma Dlamini has a certificate hanging on her wall from St Edwards hospital where she attended a course on working with Western medicine. A jar of Panado, sitting in between bunches of herbs, is her prosaic cure for headaches. This adaptation of tradition for an urban audience is also visible in the bovine head cookers restaurant. Located at the rear of the Early Morning Market, the bovine head cooking business started in 1985. Originally working against a wall of the Market, the city has since built a structure to house the cookers and their patrons. The restaurant has a roof overhead but no walls. Against both sides are large cement blocks with stainless steel tops – preparation and serving table in one. Some of these tables have plastic clothes while the ubiquitous aluminum ‘big pots’ line one wall. Zulu dumplings, the size of my fist, wait patiently for orders. A steady stream of people wind their way through the restaurant, which also serves as thoroughfare to the vegetable market. Occasionally someone stops for a quick meal or a chat. As we talk, she skillfully skins a bovine head. Beside her another cook uses an axe to cut through a skull. I’m cautioned to watch the blocked drains, where waste has been rotting for the past few weeks as the cooks wait for the city to send someone to empty their septic tank. I order one portion, with a Zulu dumpling. It is served on a blue plastic plate. The meat is surprisingly tender and tastes good. The recipe is simple – water, salt and the bovine head in a large pot. Boil and serve. I sit next to another patron, Bongani, who is waiting for a train. “I like this food but,” he explains, “it is not normal in Zulu custom for women to touch the bovine heads.” In rural areas the preparation and cooking is strictly done by men. Warwick is a good business, for all the traders that operate within its borders. The steady stream of commuters guarantees a regular income. This constant interchange between people means that Warwick also represents an unlikely fusion – between African and Indian, between tradition and modern, and rural and urban – where the possibility of a new, African urban identity emerges that is more about hybrid cultures and intersecting ways of being. The uniqueness of what has developed here, despite all its problems, is something that Durban should be proud of. It is, as many people have called it, the heart of the city and one that beats with the pulse of an African city embracing its future and past simultaneously. This entry was posted in Africa, Publishing and tagged Creativity on September 25, 2012 by Niall McNulty.